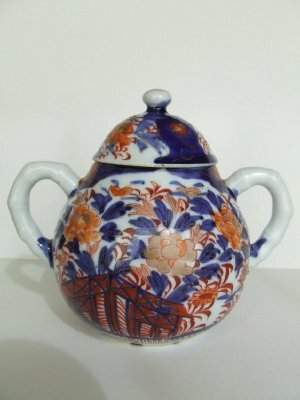 Description Dalton "Imari" tea set sugar bowl. "Allis Sidebotham and Adam Jackson, both of Derbshire, England, were married at Stockport and left for New Zealand in November 1841 on the sailing ship, 'Martha Ridgway', landing at Nelson in April 1842. They moved to Blenheim in 1856. The china is part of a dinner and tea set, it is Dalton 'Imari'," says Mrs. Ngaire Wyatt.